Outlook-Lokniti-CSDS Election Analysis: What Led To Congress' Win In Hindi Heartland? Celebrations had become a rare occurrence at the Congress headquarters, especially on a counting day. A resigned air of gloom, and formulaic words of courage that even the speaker did not seem to believe, had become second nature in the party. This mood—a kind of defeatism, in both literal and figurative senses—had set in even before the ‘Tsunamo’ of 2014, when the party was reduced to 44 seats in the Lok Sabha, and settled over the Congress like a thick, murky winter smog that would neither leave nor allow any clear vision out of it. Like a fallen pugilist still haplessly receiving punches, it bore silent witness to its footprint shrinking across the map. Even as late as March 2017, it sat paralysed as the BJP took three states—Goa, Manipur and Meghalaya—where the Congress had actually been the single largest party. Punjab, a victory with a strong local imprint, was almost the exception that proved the rule. Indeed, the political project of its prime opponent was to create a Congress-free polity, and the party ­almost seemed to be a clueless ally in that project. December 11 changed that decisively. The first signs of life, of a new combat-readiness, had come with Ahmed Patel’s Rajya Sabha election in mid-2017, took firmer root with the tough fight in Gujarat last December, and sprouted its first blossom in Karnataka this summer. But winning three major Hindi heartland states—always given a bellwether status—means it has conclusively shattered the shell it had retreated into. The news that the Congress was winning Madhya Pradesh, Rajasthan and Chhattisgarh—and crucially, winning them in a direct one-on-one fight with the BJP—was good enough to break the old quietude at 24, Akbar Road, and for the drums to start rolling. The Congress HQ was quietly expectant and yet to fill up in the morning, but as the early trends showed promise, the place suddenly came alive, and by noon it was festooned in celebrations. It was, literally, party time. There was no stopping the footsoldiers, who had almost forgotten what a victory feels like. They burst firecrackers, distri­buted sweets, danced to the dhol, shouted slogans, and held aloft placards hailing Rahul Gandhi as a leader whose time has come. Hoardings crediting the “historic victory” to his leadership came up outside the AICC office. It’s an old line, but had never had such a ring of conviction before. No longer did it sound like something parroted by spokespersons whose sole brief was to defend the leader. The next mental step was almost inevitable: most people did not shy away from expressing their intent to see him as the country’s prime minister. Now, 3-0 in the Hindi heartland may or may not offer sufficient winning momentum for the big one in 2019—it’s a much vaster, more messy and complex field. And Narendra Modi is a formidable opponent still: poll after poll shows him as personally India’s most popular leader. His ora­tory and charisma still work like an unquantifiable, magical X-factor. Politically, he’s stung now—that means he’ll up his game. Expect both a policy fusillade and a very focused tactical blitz to change the narrative: think Vijay Mallya, Christian Michel, Robert Vadra…. For the Congress, though, the verdict was proof that the Modi-Shah combine is not invincible. It also opens up more doors in terms of coalition-making, and from a posi­tion of strength. Potential allies, justly sceptical earlier, may now be more amenable to accepting Rahul/Congress as the viable centre of a national alliance against the BJP. Bahujan Samaj Party supremo Mayawati, who played hardball during pre-poll ­negotiations, promptly offered the support of her two MLAs in Madhya Pradesh to enable the Congress to reach the simple majority mark of 116. Her intransigence vis-à-vis the Congress had been the big imponderable in the mahagathbandhan in Uttar Pradesh. This may prove to be a significant turnaround. The air of disbelief at the BJP’s imp­osing new headquarters presented a stark contrast to the jubilation at the Congress office. Amid whispers that the new address at Deen Dayal Upadhyaya Marg is inauspicious, party leaders tried to put up a brave front. Every time a SUV pulled up ­inside the compound, TV crews rushed, anticipa­ting the arrival of the party chief. Amit Shah, however, did not show up in the party office that day. It wasn’t an occasion suitable for the usual display of smug triumphalism. That the Congress had lost its last state in the Northeast did not dampen the spirits of party leaders and workers. The revival in the heartland was more than a consolation: it was as if the old trend had just reached the periphery, while the centre itself had moved on. “We know the results could have been better for us, especially in Rajasthan and Madhya Pradesh, and we are going to work on it. We will ensure all creases are ironed out before 2019,” says a party veteran, adding that as of now it is time to savour the ­return of the Congress. After a series of morale-crushing losses in Haryana, Jharkhand, Maharashtra and Assam, the Congress seemed to have lost even its basic political instincts. However, after taking the BJP to the edge in its fortress Gujarat, it realised the saffronistas too had chinks in their arm­our that could be breached. And then Karnataka helped bury the humiliation of Goa, Manipur and Meghalaya. With these three big victories, the Congress has increased its presence as a ruling party to five states, including the coalition in Karnataka. The BJP, which was avowedly working towards a ‘Congress-mukt Bharat’, now rules in 16 states—four of them with ­allies. At his post-result press conference, Rahul alluded to that slogan in a genteel fashion, saying he does not believe in ridding India of the BJP, only fighting it democratically. December 11 undoubtedly belonged to the Gandhi scion, who took over the reins of the party from his mother Sonia Gandhi exactly one year earlier. She beamed as she credited the victory to Rahul’s “hard work”. Indeed, he had addre­ssed 82 rallies on his campaign trail in these five states. For a politician who seemed to have long been stuck in gestation, who had been mocked as ‘Pappu’, sneered at as a ‘Naamdaar’ (entitled one) by the prime minister and condescendingly chided by Shah for his ‘bachpana’ (immaturity), the returns were imp­ressive. The new, toughened Rahul’s response went bey­ond the much-talked-about hug and wink in Parliament. In a complete change of tactics, he started taking on the PM ­directly, attacking him relentlessly in his rallies and on social media—saying ‘chowkidar chor hai’, talking of Nirav Modi and the Rafale deal. These constant attacks on Modi were part of a well-thought-out strategy to puncture the aura of invincibility around the PM. A Congress strategist, working closely with Rahul, says it was aimed at taking the awe-inducing mask off the PM’s face. “Over the past few years, the BJP had succeeded in projecting the PM as somewhat of a superman—someone who cannot err, someone to be feared. They kept him away from all blame and criticism. They built a narrative that even disruptive moves like demonetisation were in national interest. The PM too remained aloof, living up to that larger-than-life image. That image had to be dented,” the strategist explains. The constant hammering of Rahul by Modi-Shah had left even the average Congress worker dispirited: they imbibed the fear, internalised the doubt. “It was ­almost a psychological war. It had to be countered,” he says. “Suit-boot ki sarkar” in 2015 was the first riposte that hit ­directly at Modi’s aura, but it was a one-off. Now, it’s been fine-tuned into a whole, sharp strategy—and it seems to have worked. “Modi is no more a sure-shot vote-getter. His rally speeches have no novelty value anymore. His insults no longer seem amusing, but are seen as in bad taste. Shah is no longer the infallible Chanakya. They are just like any other ordinary party that can be ­defeated,” he adds. Rahul also increasingly projected himself as Modi’s ­antithesis, countering the politics of hatred and divisiveness with words of love and peace, and arrogance with self-deprecatory modesty. A tweet by INC India at the end of the counting day summed it up: “Democracy has won! Thank you India, you have chosen love over hate, peace over violence & truth over lies. This victory is yours. #CongressWinsBig. Thank You, India.” This was acc­ompanied by a photograph of Rahul. The Congress has also learnt how to play the perception war from the BJP, and is taking it to its door. While the results have shown the limitations of shrill Hindutva for the BJP, the Congress’s newly minted ‘Hinduised’ image—a calculated move to shed its minority-appeasement tag—seems to have benefited it. ‘Temple run’ scored over Ayodhya and cow lynchings. “The BJP questioned Rahul’s identity, his gotra. They ensured his Hindu status remained at the centre of discourse. We didn’t have to do much,” says a senior Congress leader. Its ‘soft Hindutva’ may have brought in savarna votes, says political scientist Prof Sudha Pai. In Madhya Pradesh, it was also reinforced by the party’s gut instinct of not aligning with the BSP. Along with his air of sobriety, “Rahul’s explanation of Hinduism as something that brings people toge­ther probably went down better,” she says. She sees a well-thought-out stra­tegy, with Shashi Tharoor’s book Why I am a Hindu also part of this play. However, she believes what turned things around for the Congress was the content of its politics, not form. “Rahul stood with the right issues: farmers’ distress, Dalit anger, unemployment, discontent among the youth, the problems arising out of demonetisation and GST,” says the retired JNU professor. It worked also because the BJP had failed the agrarian economies of the three heartland states. If these assembly results are projected onto the Lok Sabha, the BJP has a lot to worry about. If voting preferences remain the same in 2019, the BJP stands to lose more than half its seats in the three states—from 62 of the total 65 Lok Sabha seats here, it could come down to 30 or less. Indeed, the Congress is now looking at making a comeback in Uttar Pradesh, where the BJP had won 71 out of 80 Lok Sabha seats. (Significantly, Kairana, Gorakhpur and Phulpur were among the eight Lok Sabha constituencies the BJP has lost in bypolls since 2014. In 27 bypolls, it held on to five LS seats with reduced margins and failed to wrest any seat held by the Opposition.) “If we hold on to this voting pattern in Rajasthan, Chhattisgarh and Madhya Pradesh, and also manage to crack UP, the BJP is in trouble even with ­allies,” says a Congress general secretary. Nor is the Congress planning to rest on its laurels. In ­victory, they can’t lose sight of the challenges thrown up­ ­during the campaign. Candidate selection, factionalism, soc­ial equations—all this will be key. “If they want a ­repeat in 2019, in the next six months the Congress will have to work very hard to deliver what they promised: loan waivers, jobs, transforming agriculture. They have managed to revive the state units, but now have to work at curbing factionalism and managing the generational change,” says Prof Pai. 25 That’s the number of seats the Congress lost because of the BSP eating into votes, rendering it a much closer contest than it may otherwise have been. (The BSP’s votes being higher than the margin by which Congress lost to the BJP.) The SP and independents played spoilsport for Congress in six seats each. Independent candidates also stymied the BJP’s chances in two seats. The Gondwana Gantantra Party, which otherwise failed to win any, came second or third in eight constituencies, affecting the outcome significantly. 14 That’s the number of seats the BJP won where the Congress seemed to have lost because of independent candidates. 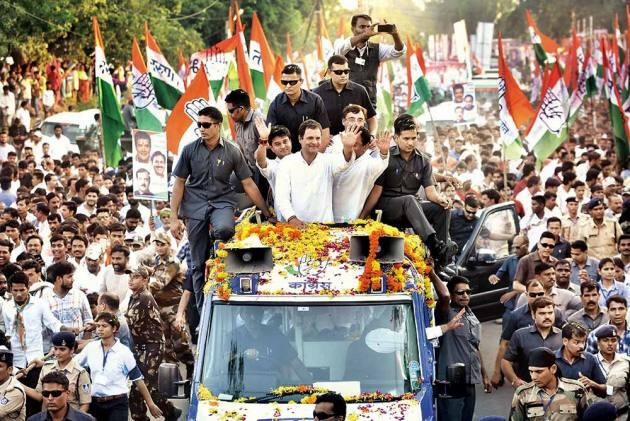 The BSP stalled the Congress’s ascent to victory in as many as nine seats in Rajasthan. In addition, the BJP lost to the Congress in 13 seats, where independents secured more votes than the margin of victory. The Rashtriya Loktantrik Party, which won three seats, also affected the outcome in 16 others, emerging second or third in those constituencies. 14 That’s the number of seats where either the BSP or its ally, Ajit Jogi’s JCC, ensured the defeat of the BJP. The Congress too lost nine seats on account of the votes taken away by this alliance. Paradoxically therefore, the alliance affected the BJP more negatively than the Congress.